The more I played the 10,000 Maniacs side of that tape, the more I loved it, so it wasn’t long before I bought a copy of In My Tribe for myself. The record represented a thoroughly modern take on the folk-rock of people like Al Stewart, whose music I was very much into at the time. It seemed to contain multitudes: Natalie Merchant’s singing gave tender, expressive voice to her socially conscious lyrics, while the late Robert Buck’s fluid, chiming guitar and the inspired rhythm section fused to form a music that was as beautifully melodic as it was headily rhythmic. Emotionally brave and uplifting to the core, 10,000 Maniacs showed me that rock could be delicate, gutsy and literate all at the same time. Delving back into the group’s past, I quickly snapped up their major-label debut, 1985’s The Wishing Chair, which I found to be every bit as good as its successor. In many ways a more complex and challenging record than In My Tribe, what it lacked in radio-friendly sheen it more than made up for in its baroque construction and in some of the most exquisitely crafted lyrics I had ever read. These songs were like intricate character studies, filled with fleeting observational moments and driven by an energy that ranged from the poignant (“Lilydale”) to the appalled (“My Mother The War”). Plus, it contained the lilting and graceful “Just As The Tide Was A-Flowing”, a traditional English folk song that I was to meet again, many years later, on No Roses, that pivotal album of English electric folk by Shirley Collins and the Albion Country Band. The Albions’ version far predates the Maniacs’, of course – indeed, it could be said that the Maniacs’ version is a cover of the Albions’ – but if push comes to shove I’ll take the latter over the former any time. Every so often I would try to score copies of the Maniacs’ début EP, Human Conflict No. 5, and LP, Secrets of the I Ching. They turned up not infrequently at record fairs and in second-hand record shops, but the hefty price tags they commanded held me back. It wasn’t until 1990, when they were reissued together under the title Hope Chest, that I finally managed to hear these fascinating early salvos. And the group promoted the reissue with a European tour, of which more later. The next 10,000 Maniacs album, 1989’s Blind Man’s Zoo, was a slight disappointment after the wonders of In My Tribe. Although it contained many fine tracks and, in “Dust Bowl”, one of Natalie Merchant’s most emotionally devastating songs, there was a weighty and ponderous tone to some of it that didn’t quite connect with me as previous albums had. Still, there remained something brave and uncanny about the group, a flinty nostalgia that was reinforced by the historical iconography of the record covers, their layout and their typography. I especially liked the way the lyrics were printed as prose, casting the songs as short stories and the music as an ongoing chronicle of a lost, haunted America. By the time of the follow-up, 1992’s Our Time in Eden, 10,000 Maniacs were at the height of their powers. From the forlorn grace of “Noah’s Dove” to the exuberant “Few and Far Between” and the cinematic splendour of “Stockton Gala Days”, the record was a towering achievement. Epic in scope yet abundant in recollected detail, Our Time in Eden was as sonically gorgeous as it was socially aware. Sadly, it was to be the last proper 10,000 Maniacs record, as during its recording Natalie Merchant put the group on notice of her intention to leave to pursue a solo career. 1993’s MTV Unplugged, unfortunately the only official Maniacs live album, signalled the way the wind was blowing even before the official announcement of Merchant’s departure. The cover showed an expensively dressed and coiffed Merchant perching elegantly on a stool, the floral print dresses and exuberant dancing of earlier days nowhere to be seen, the band somewhere out of shot behind her. The pre-show announcer said “Please welcome Natalie and 10,000 Maniacs,” a divisive enough statement borne out by the record itself, which foregrounded Merchant’s vocals at the expense of the lopsided energy that characterized the studio records. And that was the end of that, as both Merchant’s limp solo début Tigerlily and the Maniacs’ dismal post-Merchant effort Love Among the Ruins confirmed that I had no interest in either party’s subsequent endeavours. It was a sad end to a group that had meant so much to me. My experiences of seeing 10,000 Maniacs live were chequered and eventful, to say the least. I first saw them at Hammersmith Odeon on the Blind Man’s Zoo tour, but I can’t remember very much about that. I do, however, recall my second and third Maniacs concerts very well indeed. The group did a three-night residency at the Town & Country Club in November 1990 to plug the Hope Chest reissue, of which the one I attended (the first of the three) is still in the running for the best concert I’ve ever seen. Original member John Lombardo, who had been the support act with Mary Ramsey, rejoined the band for the occasion. Two events in particular ensure that this night is etched on my memory. As was – and still is – customary, I was down at the front. All was well until some idiot, perhaps under the misapprehension from the group’s name that they were some kind of thrash metal outfit, launched himself mid-song into the front row and singlehandedly tried to turn it into a moshpit. His arms flailing wildly around, this dolt received short shrift from the people around him, from the nearby security detail and indeed from the peace-loving Merchant herself, who expressed her displeasure at his actions from the safety of the stage. A little later, the group launched into the majestic “A Campfire Song” from In My Tribe, the studio version of which featured a duet between Merchant and REM’s Michael Stipe. (Merchant’s occasional duets with Stipe were always essential listening. The cover versions of “To Sir With Love” from the 1993 MTV Inaugural Ball and “Hello In There” on the Time Capsule DVD, the latter filmed on a rainy afternoon in Glasgow with Billy Bragg on guitar, are among my most enduring moments of 10,000 Maniacs fandom.) As was well known to fans at the time, it was standard practice for Natalie to hold the microphone up to someone in the front row and encourage them to sing Stipe’s part. Well, you can guess the rest. That person was me. I’ve never been much of a singer, and of course I made a terrible hash of it. Much to my horror, a bootleg of that concert subsequently emerged, which can now be downloaded from the internet. If you grab it, do yourself a favour and skip the duet part of “A Campfire Song”. 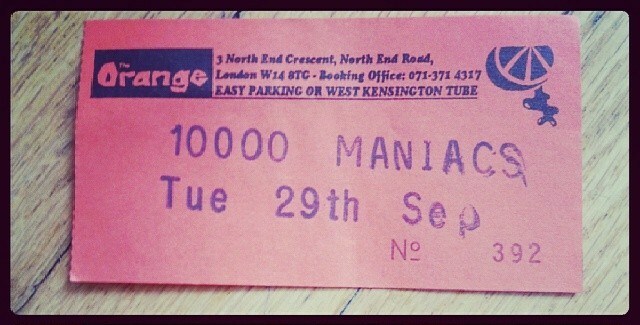 Two years later, I was lucky enough to secure a ticket for the last ever UK concert by 10,000 Maniacs, which took place on 29 September 1992 at the Orange, a tiny club in west London. This was some kind of one-off showcase event; the group never mounted a proper European tour in support of Our Time in Eden, presumably because Merchant didn’t want to do so. The gig was announced in the news pages of NME, and I duly went along to the venue on the day tickets went on sale, knowing that they would sell out very quickly indeed. The queue was enormous, but I got there in the end; how simple it was to buy concert tickets in those far-off days. Unfortunately, my enjoyment of the evening was marred by an unpleasant incident that happened to me on the way there. I was walking along Kings Avenue towards Clapham North tube station, and caught up with a group of two or three youths walking in the same direction as me on the pavement. Because I was in something of a hurry (as I always am), I stepped out into the road to overtake them. The next thing I knew, I felt a kick to the back of my legs. I fell to the ground, and was struggling to get back up when I felt another kick, this time in my face. I braced myself for more, and worse, but thankfully it never came; my attackers melted away, their desire for a quick, violent thrill seemingly fulfilled. Somewhat shaken by this event, I was not really in the mood for the concert. From what I can recall, 10,000 Maniacs gave a stunning performance that night, their great last songs charged by lightning bolts of history, discovery, repentance. Less than a year later they were no more, but their legacy remains, not in the debased version of the group that survives or in the polite restraint of Merchant’s solo career, but in the five records they made together, each of them a masterpiece of modern American music. This entry was posted in Tributes and tagged 10000 maniacs, natalie merchant by viennesewaltz. Bookmark the permalink.